Here's an useful free application called INRIX TRAFFIC that can quickly view real-time traffic flow maps in 126 cities across the U.S., and Canada and on over 160,000 miles of freeways and highways (including all interstates.) The app combines real-time, crowd-sourced traffic information from more than 1.3 million vehicles with insight from hundreds of public and private sources. Every driver in the network anonymously and automatically sends their speed, position and heading to INRIX Smart Driver Network servers. INRIX intelligently combines your information with real-time data from other drivers and traditional road sensors and then instantaneously updates the traffic maps on INRIX TRAFFIC! Everyone in the network benefits from up-to-the-minute, accurate traffic information with superior road coverage. The interesting part is that You can use INRIX TRAFFIC! for free. No hidden payments or subscriptions! You can download at the Android Market. For iPhone 3G/3GS users, the application is also available at iTunes App Store. 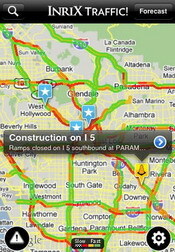 0 comments on "INRIX TRAFFIC is a Free app for iPhone, Android users to avoid trafficjams"